From all our natural resources, water is maybe the most valuable of all for us, because without water, human body can only live during 3 days. We must take care of our water, and Sun & Climate offers different products of water recycling with this aim: sewage treatment, grey water recycling, rainwater harvesting, decalcification and reverse osmosis. Sewage comes from kitchen and toilet waste. According to the FAO, they are especially efficient for irrigation. Water is an essential natural resource for human survival and for ecosystems balance. In some countries with dry climate, goberments are already taken measures to ensure water supply, for example the outspread of desalination plants. But there are already strong water shortage in some places, as some Indian states. California and Arizona could possibly also have problems. gray water recycling: water coming from baths, showers and lavatories. recycled residual water is specially recommended by FAO for irrigation beacuse its treatment removes all germs, but keeps sulfats and nitrats, that stuff applied as fertilizer. Sun & Climate offers you its broad experience installing seawages. Our products range offers you the best solution for your needs. Water is a limited natural resource, essential for human life and ecosystems. Once used, our water remains polluted. It is our responsability to recycle it. Total oxidation sewage Picobell is based on a continuous process in three phases: accumulation, oxidation and decantation, that reaches very good levels of depuration. Picobell sewage is compound of a Carat S tank with three different chamberes, and exterior compressor, a ventilation pipe and support stuff for oxidation (Picobells). Air compressor that aports oxidation is integrated into a compact closet outside the tank. The same compressor makes all the movements and processes inside the depuration system, using a very simple and efficient system. It is possible to keep the high level of depuration even with variable input regimes. Maintenance of this equipment is minimal thanks to the constant autocleaning process of Picobells stuff and its control system. Thus, maintenance is only to control the correct functioning periodically. Exclusive system Picobell is constantly in contact with residual water. This balls get clean by theirselves thanks to the constant movement and the contact with the air, so they don't need maintenance. Why total oxidation sewage ? Total oxidation, as its name says, means a forced oxigen contribution during depuration process. It is proved that this anaerobic process of oxidation is the depuration technology with best results by giving oxigen to organism microorganisms responsible of biological cleaning of water. La comodidad de una depuradora compacta es que todo el proceso se lleva a cabo en el mismo tanque y solamente tenemos en el exterior el compresor junto al punto de control de todo el sistema. Junto con la garantía de durabilidad y robustez que ofrecen nuestros tanques de polipropileno y la simplicidad de su instalación, nuestras depuradoras son una solución ideal para depurar aguas residuales domésticas de una forma simple y eficaz. A compact sewage means a high degree of comfort because the whole depuration process takes place in the same tank and we only have outside the compressor next to the control point. Our sewages are the best option for domestic residual water recycling because of its long life, robustness and simplicity. They base their process in three chambers. First chamber. Residual water comes into the first camara, and solids are put down at the bottom. More clean water of top goes into the second chamber throught a overflow system. Second chamber. Biological depuration takes place with two basic elements: Picobells and oxigen injection. Picobells are hemispheres with about 3 cm of diameter that moves throught the whole chamber, where microorganism get bound. Thanks to exclusive design of Picobells, contact surface in oxidation chamber is multiplied. Air is apported by means of an external comrpessor that we installa in basement or in the garden. Third chamber. Rest of mud get down to the bottom and water goes into the first chamber to start the process again. Clean water can start to be used. Total oxidation sewage Klaro uses sequentical depuration SBR. All the process phases such as accumulation, oxidation, clarifying and extraction are made with three pumps. Compressor also feeds diffusing membrane at the bottom of the tank, whichis the one provoking the oxidation of reagent mud. Maintenance of all the components is minimal, then they are in an external closet with easy installation inside the house. Klaro sewage, with SBR technology, doesn't need mecanichal movements inside the tank. Every movement are generated with compressed air coming from compresser. Compact closet inside the control system is installed inside the house and requires a minimal maintenace. LCD screen shows service hours of every element. Any electric supply failure is shown with a visual and sound alarm. Every closet components are easy to reach if a repair is necessesary. Modular design allows to save time and many in case of repair. Maintenance only means to prove regularly the proper working of the whole system. 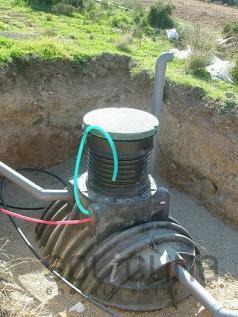 Compressed air hose, located between the tank and the control system, are distinguished with colours codigs. This avoids failures in the installation. Depuration system is already installed in the factory, so it is only necessary to join it to the wall of the tank. Klaro system allows a really fast assembly. Klaro sewage can get adapted to conditions change with the ajust of cycles times. This system also have a holiday status, so aeration ajusts to the loading. residual water comes into the decantation chamber and solids got down to the bottom. More clean water of the top goes into SBR chamber, the second chamber. Biological cleaning through microorganisms and reagent muds takes place in this phase. The process is made by means of a combination of alternative periods with oxigen treatment and rest. Reagent muds develop millions of microorganisms that clean up water on a totally natural way. Mud rest on the bottom of the tank, while clean water is on the top of the tank. Clean water comes out of the tank and can be directly used. Mud accumulated on the bottom of the tank comes into the first chamber to start a new cycle. By recycling wastewater, also called black water, we can obrain water that is not potable but, sufficiently sanitized to use safely, for irrigation. In fact, the FAO recommends the use of this type of water for irrigation, because the treatment given to it, does not remove the phosphates and nitrates, which are chemicals that are utilized in artificial fertilizers. This way, the benefit is twofold. On the one hand, we recycle the water in places where water is a scarce resource and secondly, we can irrigate some plants that might otherwise dry.